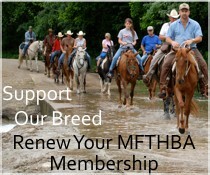 For over 50 years, the MFTHBA, through the work of volunteers, has continually promoted the development and refinement of the Missouri Fox Trotting Horse. Today, there are more than 100,000 registered Missouri Fox Trotters around the world. In 1998, to honor those volunteers who have worked so tirelessly, the MFTHBA Board of Directors established the Missouri Fox Trotting Horse Breed Association Hall of Fame. In 2009, the Horse Hall of Fame was established to recognize the exceptional horses that have left an indelible mark upon the breed, The inductees—both human and equine—are listed below.